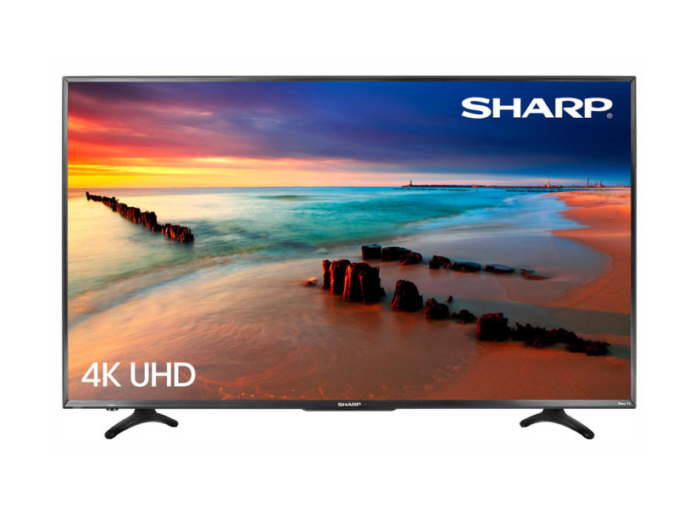 A good entry-level 4k UHD TV in terms of picture, but with a superior user interface and remote. 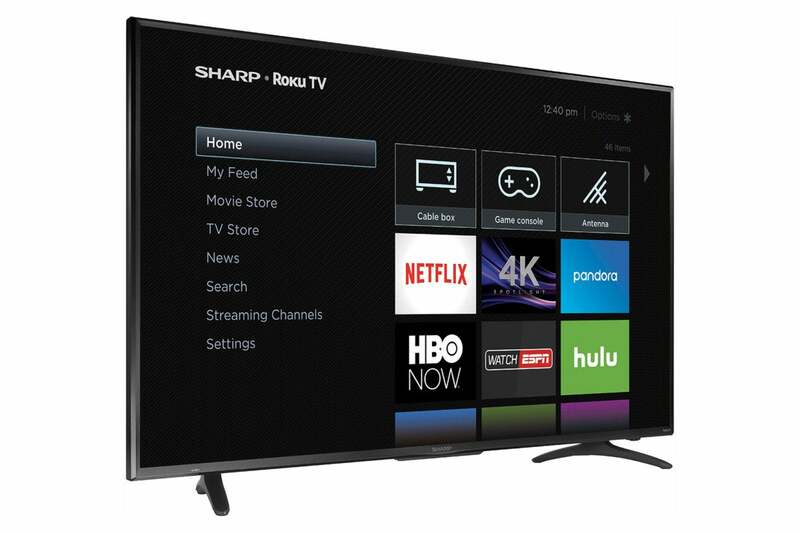 Sharp’s Roku 55-inch class 4K UHD (model LC-55LBU591U) is one of the better entry-level TVs we’ve seen recently—although it’s actually manufactured by Hisense under a 5-year licensing deal the two companies signed in 2015. This TV delivers a great interface (powered by Roku), and a better-than-average image for $600 ($479.99 at Best Buy at the time of this review). That said, it doesn’t look as nice as the last the Sharp TV we looked at—the Aquos N7000—which was actually manufactured by Sharp. The LC-55 employs blue-skewed LED backlighting, and the motion isn’t as smooth as we’d like. But we can say that about nearly everything else in this price range. The LC-55 is good smart TV for the money. 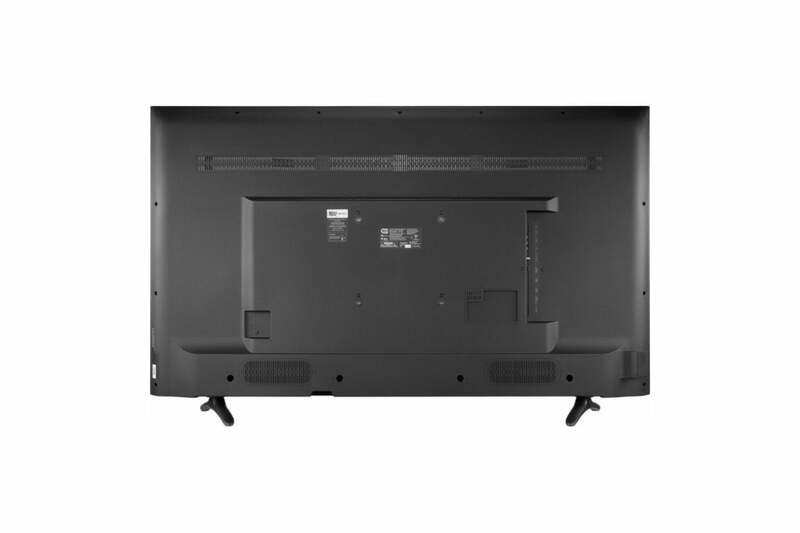 The LC-55 renders images on a 54.6-inch (55-inch class), LED-backlit, 3840 x 2160 4K UHD LCD panel. The TV as a whole is modestly stylish, though with today’s super-thin bezels, appearance isn’t a huge issue with any TV—there’s simply not that much to see. But while the bezel is a thin 3.3-inches, the TV itself is not—not even by the standards of a few years ago. That’s not an issue for most users, but if you want the illusion of your TV being part of your wall, this isn’t what you’re looking for. Regardless, it will accept a standard 200mm VESA wall mount, and at 38 pounds, it won’t strain the screws too much. 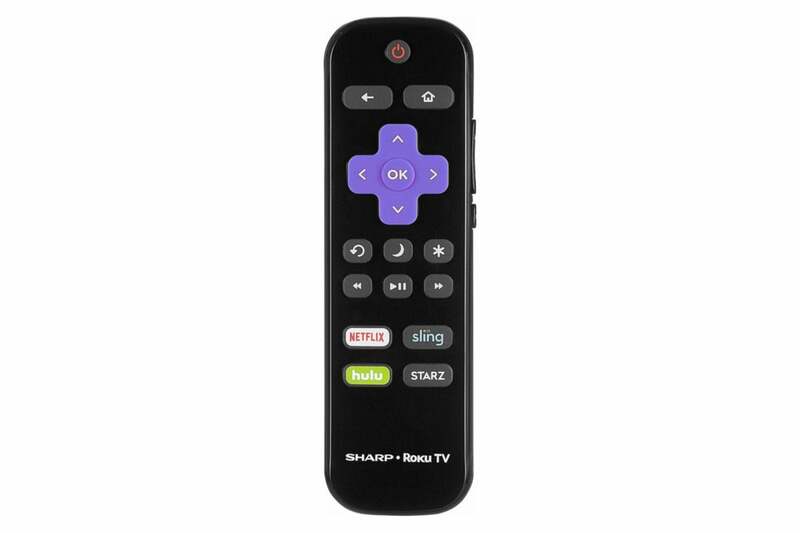 The Sharp Roku LC-55 has some old-school ports to go with all the modern ones. We were a bit amused at the inclusion of a composite video output, which isn’t common on new video players and the like. It’s easy to forget that this is still the bottom-line input for a lot of older, but still perfectly viable video equipment. After our inappropriate chuckle, we remembered that we still have some of that stuff. The rest of the ports are strictly of the “modern” variety: three HDMI 2.2 ports, one with ARC (audio return channel), RCA analog audio out, optical digital audio out, and a headphone jack that people in apartments can take advantage of. Data connectivity comes in the form of ethernet, an 802.11n Wi-Fi adapter, and a single USB 2.0 port. OTA (over-the-air) TV fans will find an onboard tuner and a coax jack for an antenna. Channel-switching speed was on the edge of frustratingly slow and an impediment to surfing. Looking at the bright side, that could actually save you time by forcing you to use your program guide. You’ll never mistake the LC-55’s image for that of an OLED, but you could do a lot worse for the price. Color is decent, but has the familiar blue-skewed, cool palette that’s dominated TVs since energy-efficient and thin LED back-lighting took over. We sometimes wonder how much this cool palette has affected morale worldwide. Seriously. Color, or the lack thereof can impact your mental state. Speaking of lighting, the LC-55 produces only about 340 nits, but the liquid crystal cells leak heavily in spite of that. That means there’s not enough brightness or contrast to do HDR material justice. This TV will play HDR-10 discs and files without a hitch, but you can barely tell the difference between SDR and HDR versions on it. To be fair, Hisense doesn’t even mention HDR compatibility or performance. Good for them. We wish all TV vendors were as honest. Low nits and light-leaking cells also mean you’re not going to get particularly good black out of the LC-55—but you’re not going to do better at this price point with any of the competition we’re aware of. A good, but not great picture is what you get with the Sharp Roku LC-55. For the price, it’s about as good as it gets. Motion was surprisingly smooth for a $500 60Hz TV. There was some jitter here and there on action shots, but not enough to annoy the average user absorbed in an entertaining contest or movie. Panning shots weren’t bad either, with minimal shimmer or moire distortion. Screen uniformity was quite even. Good stuff there. The TV also did well in most of our measurements and advanced tests, with the exception of horizontal and vertical fine lines where there was a lot jumping and jumbling. 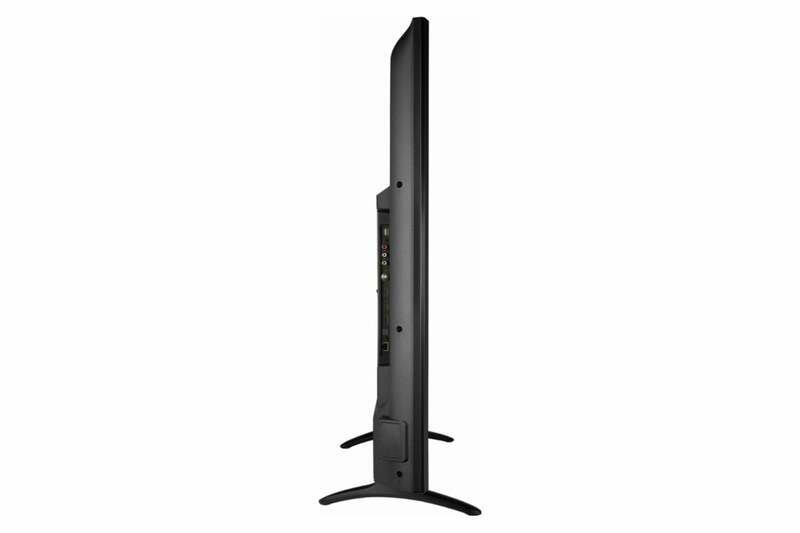 In use, that won’t affect much material, but it does scream entry-level TV. Put it all together and you have the image of a very good sub-$500 TV. Visual artifacts mild enough that they shouldn’t distract, decent if cool color, and great detail simply because it’s a 4K UHD panel. The LC-55 was also decent at up-scaling our 1080p and 720p content. The LC-55 produces enough volume and enough high end that there’s no reason to immediately augment it. That said, you’ll probably be happier routing the audio through a sound system or soundbar. Just like everything else concerning the LC-55, sound is quite good for a sub-$500 TV. While not particularly thin, there’s a lot of air to circulate around the electronics and created a passable amount of low-end from the integrated spakers. Most common media file formats are supported if you like playing media off USB drives. JPEG, .WAV, .MP3, .FLAC, .AVI, .MP4, and so on. h.264 AVC and h.265 HEVC, including HDR videos, played just fine. Dolby Vision isn’t supported, but again, Sharp makes no claim to that. Our only complaint on this front isn’t the playback apps, but the USB port’s somewhat inconvenient location on the back. Where the Sharp Roku LC-55 takes a back seat to no one, except perhaps Samsung, is with its Roku interface. 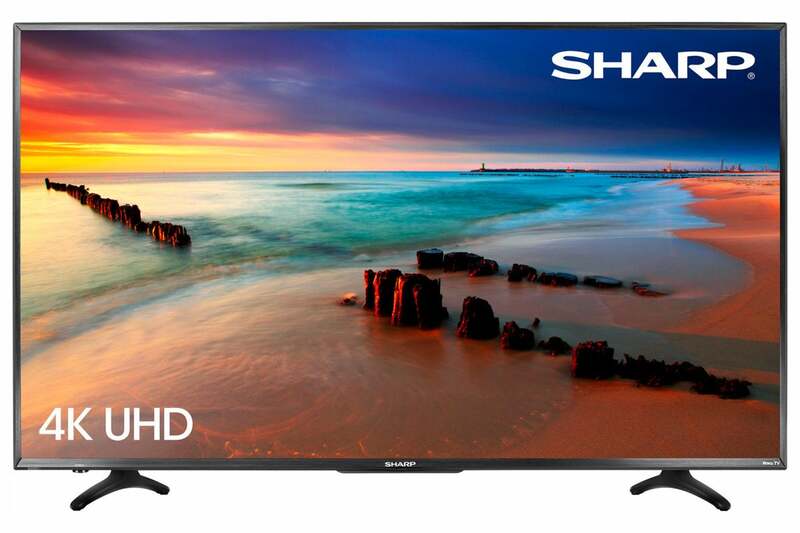 We like it on TCL TVs, and we like it on the Sharp. It’s easy to navigate, shows you a little preview of what’s playing on each input, and is married perfectly to the remote. The only thing we don’t like is the setup, which involves logging onto your Roku account or creating one if you don’t already have one. We wouldn’t mind seeing this changed. The remote has a minimal number of controls and hands off functionality to the onscreen interface in a very logical way. It even sports a headset jack so you can listen to the TV without disturbing loved ones. It’s not particularly beautiful in appearance, but there’s no arguing its efficiency. $500 for a 55-inch TV of this quality with the easy-to-use Roku interface and remote is a good deal. The picture won’t blow you away, but it won’t make you sorry you bought the TV either. You’re not going to see anything a lot better at this price point. Nice job Shar— er, Hisense.